Former finance minister Ignatius Chombo (file photo). Former Finance Minister Ignatius Chombo's trial on corruption charges was Monday again pushed to end of next month, pending a High Court's determination on his application for stay of prosecution on rights grounds. The former influential Zanu PF politician was the first cabinet minister to be arrested after last November's military coup which toppled then president Robert Mugabe. His High Court application has also stalled other cases in which the former minister is being accused together with expelled Zanu PF officials Kudzai Chipanga, Munyaradzi Hamandishe and Mathew Muleya. The quartet are facing criminal nuisance charges for wearing Zanu PF regalia days after being expelled from the ruling party. Another trial similarly affected is the one where Chombo is being charged together with local government ministry officials including Lazarus Chimba, Rejoice Pazvakavambwa and Psychology Chiwanga. 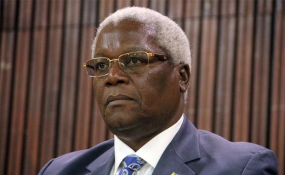 Chombo approached the High Court seeking stay of criminal prosecution, arguing that his rights were violated when he was illegally detained by soldiers in November last year. His lawyer Lovemore Madhuku said, "Proceeding at this point would undermine the administration of justice." "The victim is entitled to a remedy because where there is violation of rights there should be a remedy and the state should be liable to the damages," said the lawyer. Chombo told court that he was abducted by suspected soldiers when the Zimbabwe Defence Forces (ZDF) staged last year's coup. He said his home was also attacked before the abduction in what the ex-minister described adding as a harrowing experience for his family. Court heard that Chombo was forcibly taken from his home while it was raining and driven to an unknown place while blindfolded. The ex-minister also narrated that he was placed in solitary confinement and made to sit on a chair for seven days. He has several criminal cases pending before the courts. Besides wearing Zanu PF regalia, he is being accused of contravening sections of the Prevention of Corruption Act. In this case Chombo is charged with prejudicing Eddie Pfugari Properties of more than Z$200 million in a botched land deal. He is also accused of defrauding the City of Harare of property worth $900,000 while businessman Chargan Vithal Rama lost $500,000 in a company share ownership transfer deal.